Virgil Jester, one of Denver’s prodigal baseball figures has passed away. The former pitcher for the Boston and Milwaukee Braves died due to complications from pneumonia on February 15, 2016. He was 88. Jester was a standout athlete at Denver’s North High School, where he played both infield and pitched. So renowned for his accomplishments on field, Jester was selected for the 1944 Esquire All-American Boys Baseball Game at the Polo Grounds in New York City. Jester was the starting pitcher for the West Squad that was managed by Mel Ott. Other notables who played in that game were Hall of Famer Richie Ashburn, as well as future major leaguers Erv Palica and Billy Pierce. After attending Colorado State Teacher’s College, Jester was signed by the Braves in 1947 for the princely sum of $2,500. In a 2012 interview with the Denver Post, Jester wished his bonus arrived a half-century later. “I won 10 straight games real quick, after that they called me up,” he said during a 2008 interview from his home in Colorado. I am doing research into the Hearst Sandlot Classic and during the course of my research learned about the Esquire's Game. Do you know the identities of the players, other than Jester, in that photo? 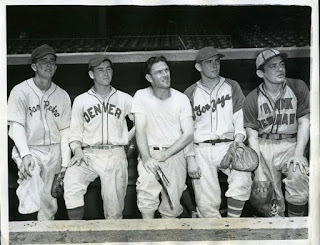 Erv Palica, Jester, Mel Ott, Jim Presley, Vic Picetti. Thank you Nick. I didn't notice your response until I did some googling this evening. Do you know where the picture first appeared? I have written more than a bit about Picetti who tragically died in a bus accident in 1946. I don't know where it appeared. I believe the photo was up for auction.